Onechanbara Z2 Chaos Now On Sale: Let’s Get Physical (But Digital Is Okay, Too) | "DESTROY ALL FANBOYS!" Let’s get this out of the way. You’re NOT buying Onechanbara Z2 Chaos because it’s anything close to AAA quality “Game of the Year” material. Nope, you’re buying because you’re a guy or gal who really like SUPER offbeat action games from Japan featuring under-dressed but overpowered ladies slicing and dicing hordes of undead creatures and creeps. That and the game is also pretty darn hilarious because it’s so intentionally over the top while being extremely accessible to about anyone who picks up a controller and wants to take it for a spin. 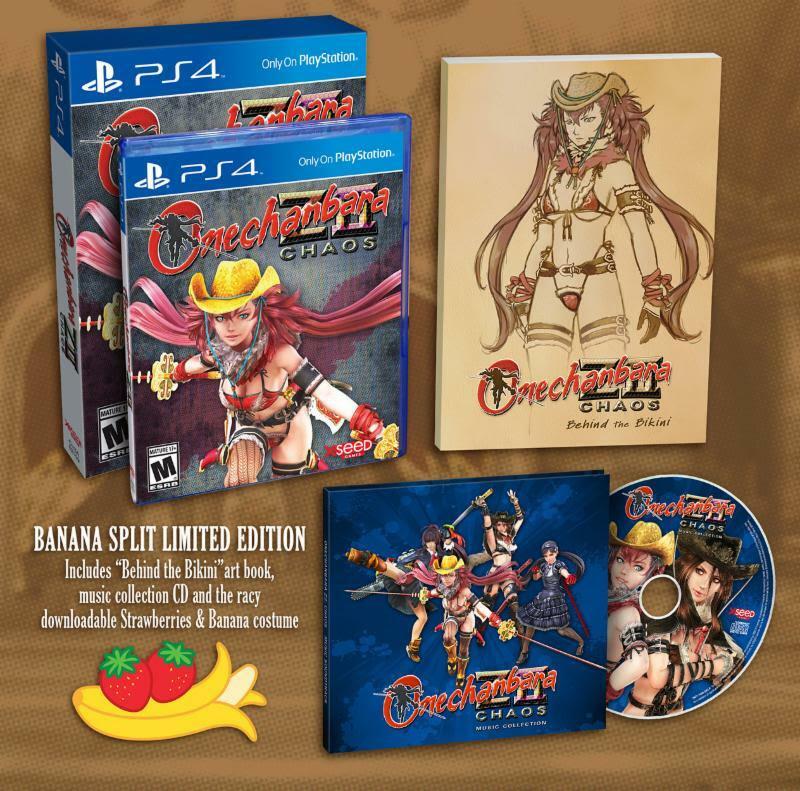 XSEED Games has two versions of the game out today; a digital download for $39.99 that includes the game and rather sassy “Strawberries and Banana” DLC “costumes”. Hey, both fruit are quite tasty and VERY good for you! Lots of vitamins and minerals and other good stuff like that there. So that LE has some nutritional and educational value. Get two! If you want something to touch and show off (fear not, Aya, Saki and the other gals won’t chop your sweaty hands off), run like the wind to your nearest game emporium with $49.99 and get the yummy limited “Banana Split” edition shown above. That set nets you a soundtrack CD packed with almost 80 minutes of music from both this game and its Japan-only predecessor Onechanbara Z: Kagura, an 80-page softcover “Behind the Bikini” book loaded with artwork and back story from both games, and a code to download that aforementioned “Strawberries & Banana” premium DLC costume. 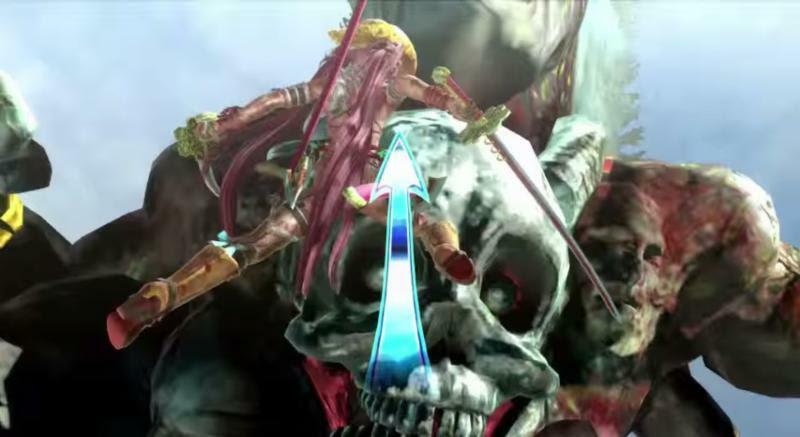 Let’s see now: so far, Onechanbara Z2 Chaos is (according to me) nutritious, educational, “sassy”, and a few other things. That sounds like a buy to me. And probably XSEED Games as well. This entry was posted in 2015, Commentary, DAF, Features, Holiday Gift Guide 2015, Humor, Updates and tagged BUY This Game, Camp Value, Digital Games, DLC, Imports, Japan, M-Rated Games, Mature, Omake, Onechanbara, Onechanbara Z2: Chaos, PlayStation 4, Pre-Orders, PS4, PSN, SCEA, SEN, Sexytime, Sony, Tamsoft, VGA 101, Videogame Appreciation 101, Videogame Trailers, Xseed Games, YouTube by geelw. Bookmark the permalink.